About three weeks we launched a new BETA version of start.me. That version featured an all new design and some cool new features. We were pleasantly surprised by the enormous amount of feedback we got! Most of the reactions were of the ‘I like it, but…’ kind. Today we are launching a new version of the BETA, in which a lot of the feedback from our users has been addressed. And we believe it got better because of it. So what has changed? We mainly tried to simplify things, making it easier to use start.me and with less clicks. Since the early days of start.me there was a big ‘Customize’ button that would switch the app to ‘edit mode’. Although this explicit edit mode certainly had its benefits, we felt that it actually made adding and updating content on start.me pages a little more cumbersome than necessary. So we removed it. With this new BETA version, everything can always be edited. Widgets can be moved just by dragging their headers. Pages can easily be sorted using drag-and-drop. And most of the other editing functionality is grouped in convenient dropdown menus. Every widget has such a menu, making it easy to find out what you can do with a widget. Some widgets, like the Bookmarks and RSS widgets, now have their own edit mode. To add a new site to a bookmarks block, simply switch the widget to edit mode by selecting ‘Edit bookmarks’ from the dropdown menu (or by double clicking the widget’s title). When you are done editing, just click the green button and everything will be back to normal. Only when you want to add or remove items from a widget will you need to switch to ‘edit mode’. If you just want to change the order of some bookmarks or move a bookmark to an other widget, just drag it. It’s that easy! We got a lot of requests from users to reduce the amount of clicks required to navigate between start.me pages. With the last update, we introduced a dropdown menu to switch between pages. That turned out to be inconvenient for a lot of people. That is why we reintroduced the page list on the top of the page. We added a convenient dropdown menu to the page list that allows you to quickly add pages and widgets. And of course, pages can be reordered by just dragging them to another position. The original page dropdown menu is still there, but got a major facelift. We made the menu larger and added some convenient editing options to every page, accessible through a dropdown menu. 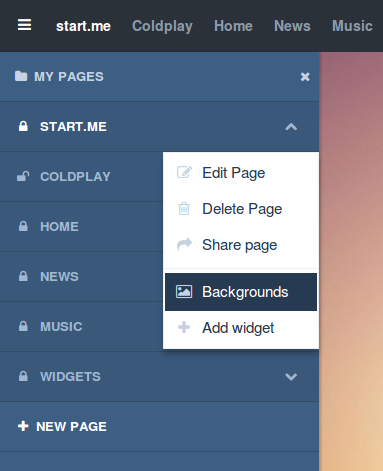 In the future, we will be adding some exciting new features to the pages menu. Many other small improvements have been made. One especially worth mentioning is the changes we made to the RSS widget. We introduced a convenient new way to switch between the various feeds displayed in a widget, saving you clicks and giving better overview. We are quite happy with the changes. But of course, what is most important to us, is that you are happy with them. We very much welcome your feedback and will try to incorporate as much as we can in the weeks before the official launch.